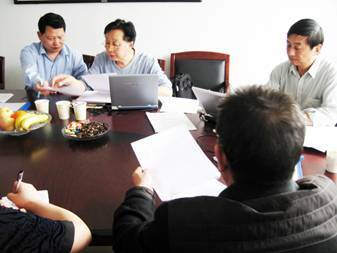 From the website: On April 20, 2007, the expert group led by Jia zhendong and Wei Rushi with their parties of Beijing Huaguang Medical Apparatus Authentication Company came to Hubei Bluelight Science&Technology Development Co., Ltd for a two-day audit of quality management system certification. At 9 a.m., the first conference of "International Quality Control System Authentication" was opened in the meeting room of the company. The general manager Mr. Luo led the staff to communicate with the Huaguang Group fervently. This conference is designed to confirm that the company establishes the quality control system which satisfies the authentication criteria in accordance with GB/T19001-2000idtISO9001: 2000; YY/T0287-2003idtISO13485: 2000, so that they can decide whether they will recommend the company to pass the registration of quality control system authentication. The Huaguang expert group will carry on the verification for each related contents of the company one by one in two days. Bluelight therapeutic apparatus will become better and better after "International Quality Control System Authentication"